The final beam was lifted and put into place this afternoon on the Orlando VA Medical Center amid the cheers of Civic Officials, Veterans, Military, Construction Staff, Medical Staff and patriotic citizens and groups. Before the very well attended 1:00 p.m. Ceremony under a Tent, all were invited to sign the final I-beam to be lifted into place. 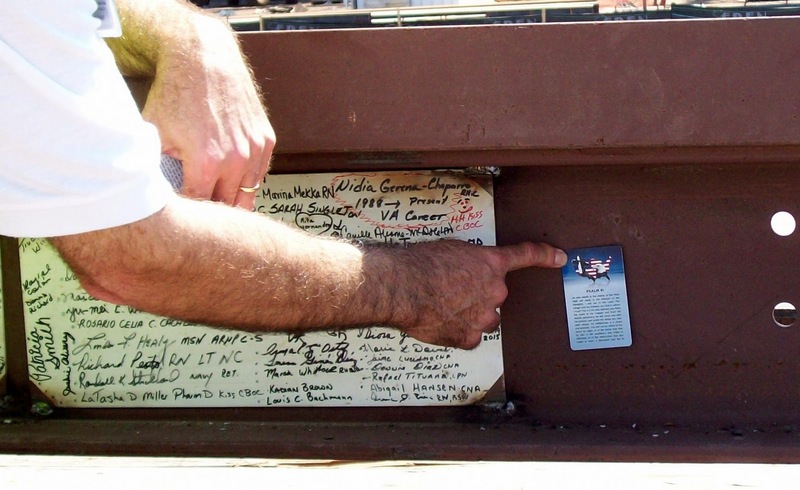 OS91 Founders Ed and Mary took the opportunity to place a plastic Psalm 91 Card to the I-beam thanks to one of the Construction directors, who most graciously put it in place. This project is ahead of schedule and under budget by $100,000,000! This facility will serve over 300,000 Central Florida Veterans. Orlando & OS91 honors and loves our Veterans! Cheers, tears and hugs for our Troops! Last night 2 buses filled with about 50 Marine Reservists arrived back from Afghanistan into Orlando. The Direct Support Motor Transport Company A11 (Alpha one one) from the Military Reserve Center normally would have been gone for 6 months but ended up serving about 10 months. The "Welcome Home" crowd gathering at The Armed Forces Reserve Center in Orlando consisted of families of these heroes, as well as patriotic citizens, The Vietnam Brotherhood, and OS91 supporters and partners Mayor Scott Vandergrift of Ocoee, Chaplain Kathie DiCesare of the Nam Knights, Vickie DiGiovanni of Blue Star Moms and Cathy Haynes of Daughters of the American Revolution, who did so much to get word out about the last minute arrival of these Heroes. "I prayed Psalm 91 when I was over there!" First time this Marine sees his baby! Our sentiments exactly: WELCOME HOME HEROES! All Points Bulletin! Spread the word! There are about 50 Marine Reservists arriving back from Afghanistan into Orlando tomorrow (Thurs.) or on Friday. The Direct Support Motor Transport Company A11 (Alpha one one) from the Military Reserve Center normally would have been gone for 6 months but ended up serving abt 10 months. The time of arrival and method of transportation is still being arranged from where they currently are located in North Carolina. Ideally they would like to arrive as a group at one time instead of being staggered out...but hey, we know how things work out with the military sometimes!!! These Marines have had some particularly rough times - providing transportation of things with frequent hazards of IED (improvised explosive devices) and deserve a nice, big WELCOME HOME! If you want to be a part of their Welcome Home, let me know ASAP so that you will be notified as soon as the local command and I know. The site will be the Reserve Center off Tradeport Drive near the Orlando Int'l Airport OR the airport itself. Time has yet to be determined. We want to form a communication tree - Spread the word, let folks know that local warriors are coming home! Plan to bring your flags, cookies, welcome signs and hugs! "I cannot thank you enough for what you have sent us. The Psalm 91 Ministry has certainly taken off here!" Founder and Chairman of "New York Says Thank You Foundation"
Patriotic citizens of Ocoee and the surrounding area gathered today with Civic Officials, Responders, Veterans, The Patriot Riders and others to welcome the historic 9/11 Flag to Ocoee. In a very touching Ceremony, local heroes nominated by others had the honor to sew a stitch in the Flag that was destroyed in the collapse of the World Trade Center. This Event is part of the 50 State National 9/11 Flag Tour by the New York Says Thank You Foundation. Besides the above Nominees, Mary of OS91 had the honor of meeting one of the Nominees who sewed a stitch in the 9/11 Flag, Cory Remsburg, an Army Ranger wounded in Afghanistan when an IED exploded on 10/1/09. We salute all the nominees who had the honor to add a stitch to this American treasure! The Good Life - Eagle Scout Jeff Cox - GLA217 from The Good Life on Vimeo. 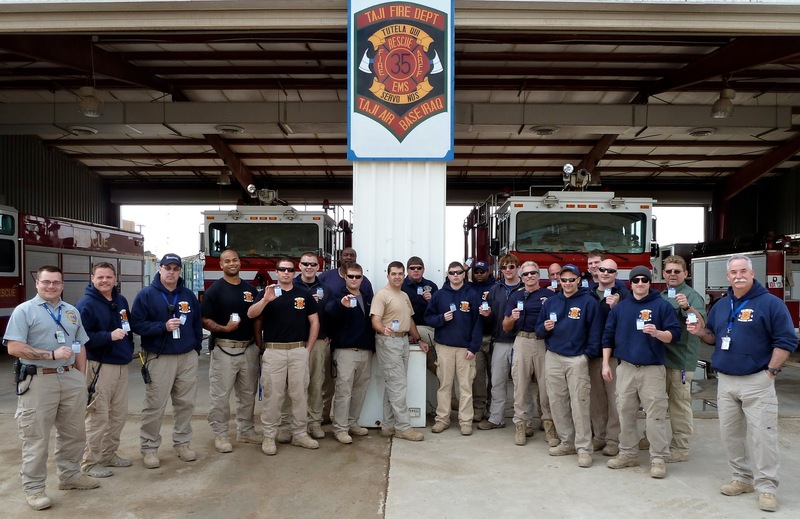 Taji, Iraq Fire Department Station 1 and 2 Firefighters holding OS91 Psalm 91 cards! Ed Ganster with Bob Pettus, Jr., former Chairman, Coca-Cola Bottling Co. Such a transparent talk Mr. Bob Pettus gave today at the Central FL Christian Chamber of Commerce Luncheon today! There was hardly a dry eye! Looking forward to a great future! Labels: Coca-Cola Bottling Co., Ed Ganster with Bob Pettus, former Chairman, Jr. I was leaving some books in the infusion center library when a woman approached me. She asked what I was doing so I proceeded to tell her about OS91. Turns out she has sons, daughters, nieces, nephews, all in the military of one branch or another. Her husband who has cancer is even aVvet. One of her daughters works with the USO in San Diego. She asked if she could have some of the cards and books and even the crosses to take to her daughter because she was sure she would want to definitely know more about it. I gave her my business card and I also showed her the website on the back of the card. Hopefully she will be contacting you! I wanted to send you my own thanks for the Psalms 91 books. This weekend was nothing short of a miracle. The books you provided were personally placed in the hand of a soldier or family member, and many were accompanied by letting us pray for them as the Holy Spirit opened the flood gates and they broke in tears. I can't put into words the look on their faces as they took this God breathed promise and prayer of protection and held it to their chest and thanked us. It is a good thing that your organization is doing. Take heart and do not grow weary, you are shining God's light in one of the darkest corners of our world...that of war. God shined His favor on us and the commanding officer who recieved his promotion to now overseeing three times the events around the country personally told us he is pulling us with him to attend them all. So we are going to be requesting many more books. LOL Your organization is blessing our military, thank you. Operation Safety 91 Founders, Ed and Mary Ganster, were invited to the Seminole County Fire Department 10th Annual Awards Banquet, Friday night, February 4th by Seminole County Fire Chief Leeanna Mims. A very impressive Ceremony indeed! What an honor to be with heroes, young, older and retired who risk(ed) their lives to keep us safe. Chief Mims introduced Operation Safety 91 to the approximately 150 attendees and briefly explained our Mission. Included at each place setting was a plastic Psalm 91 card (www.OS91.com/psalm91cards). One of the several brave Firefighters awarded was Jason Dayton, a 38 year old husband and father of 2 boys, former Insurance agent who had to "recreate" himself because of the economy. His award: "Rookie Firefighter of the Year". So many heroes and we salute you all! Friends of OS91 and table Sponsor for OS91's 3rd Annual Tribute to Honor America's 1st Responders, Star and Shield Insurance Exchange, a Sponsor of the Seminole County Fire Department Awards Banquet, was represented by Kelley Olsen with whom we enjoyed some time together during the delicious dinner. OS91 Founders, Ed and Mary Ganster, were blessed to have a visit from a New Jersey partner Chaplain for almost 3 years, John Jamieson and his dear wife Marilyn this week. Chaplain John was one of the first FFC Chaplains who not only distributed Psalm 91 books but also taught classes using the Psalm 91 books. Rev. John Jamieson, M.Div., Ph.D, Associate Regional Director of the Mid-Atlantic Region of the Federation of Fire Chaplain; Instructor at the Fire Chaplain Training Institute; Clinical Director of S.O.S. 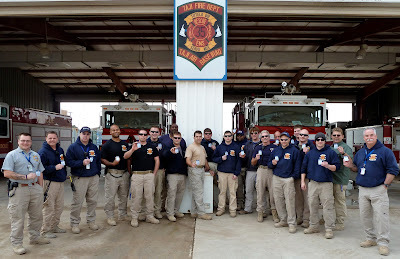 CISM Team (NJ); Minister of Central Ocean City Union Chapel; Chaplain of Ocean City Fire Dept. & Beach Patrol. His dear wife, Marilyn is a Board Member of Ocean City Central Union Chapel and head of Junior Church; a long standing volunteer at Atlanta Card and ministry to shut-ins. Marilyn Marilyn is the author of 2 childrens' books on basic computers with a Biblical view.